These days, the default 16-oz. claw hammer spends more time coaxing things into place than it does driving nails into wood. It’s been downsized by an army of pneumatic nailers that are designed for everything from driving common nails to highly specialized jobs like stapling shipping cartons in mail-order operations around the world. When these air tools first started showing up on building sites, they seemed like the natural outgrowth of the air-driven tools used in automotive shops ever since cars had inflatable tires. The reason pneumatic nailers are so popular is because they make many jobs much easier while almost always achieving better results. A simple visual explains why: Say you are trying to nail a horizontal piece of trim on a wall. You hold the trim board in place with one hand and your hammer with your other hand. Then you try to figure out which hand is going to hold the nail. 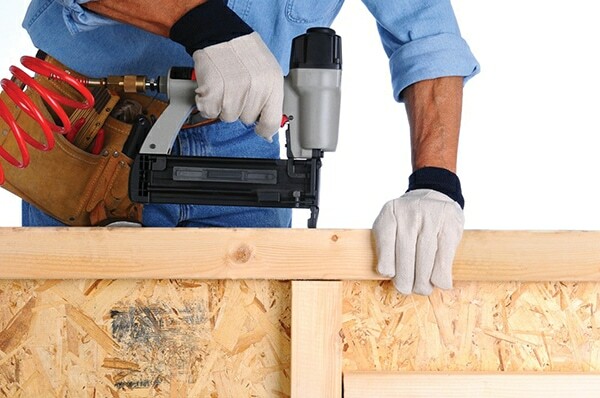 If you had a pneumatic nailer, you wouldn’t need the third hand that you never have. There’s also an added bonus: By adjusting the air pressure on the tool, you can regulate how far into the wood the nail will go. This means setting the nail head just below the surface and throwing away your nail sets. 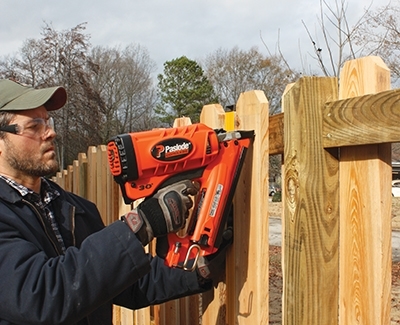 A cordless framing nailer uses a battery combined with a gas charge to fire the nails without an air hose. The nailer choices available to contractors are vast, but the fasteners these tools drive dwarf the tools that drive them. 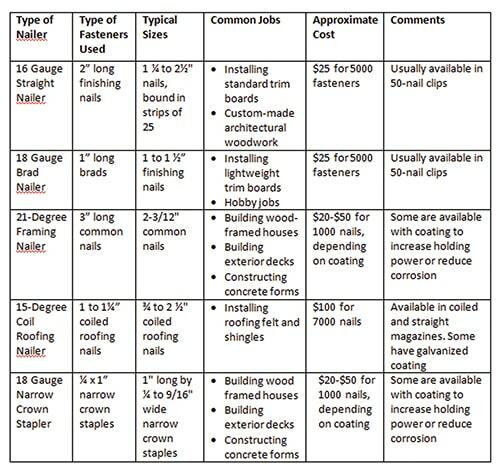 The Quick Reference Chart in this article will give you a good idea of the broad range of fasteners that are available and what jobs they can handle. Most contractors and DIY’ers will probably use only a handful of different nailers, but these tools are such time-savers that in many cases a single job will justify buying another. You can’t simply buy a nailer, throw away your hammer and suddenly have lots of free time. It’s best to keep your hammer and buy a nailer, as well as a small compressor, at least 50 feet of 1/4-in.-diameter air hose, the right fasteners for the job (and that fit the nailer), plus a little can of light oil to keep everything working smoothly. Keep the hammer on board for smaller, more delicate jobs. It sounds like a lot, but when you see how much easier these tools make your work, you’ll be happy. You might also consider investing in one of the newer cordless nailers that are powered by different fuel cartridges: NiCad batteries, compressed propane and compressed nitrogen. None of these are tethered to an air hose and compressor or an electrical cord and receptacle, making them easy to carry and use. Editor’s Note: Steve Wilson began his career as a carpentry contractor in Rochester, New York, where he owned and operated his own business. He then joined Popular Mechanics magazine as their Home Improvement Editor, a position he held for 22 years. He is also the author of three books and now writes about home improvement, nailers and other tools for The Home Depot. Collated nails for a pneumatic nailer typically come in strips that are held together by either paper or plastic. Some tradesmen report experiencing fewer nail-gun jams when using paper-collated nails, but the EHT staff hasn’t seen a significant difference in jam rates between the two types. The two types do have their different drawbacks, however. Plastic-collated nails tend to spit little chips of plastic at the user when the nail breaks away from the strip. This can get annoying, plus the tiny chips litter up the work area, and they can occasionally get pinned to the work surface beneath the head of the nail. This is not an issue for rough framing, but if the nails will be visible then you’ll have to pry the little plastic chips from beneath the heads—another annoyance. Paper-collated nails tend to generate less debris, but you should avoid making the same mistake that we once did and leave a box full of them outside in the rain. When they get wet, the paper collation essentially dissolves, and your box of strips will become a box loaded with hundreds of individually disconnected nails. Anyone who’s ever built … well, anything … knows that quality fasteners should be durable, reliable and easy to use. For the “easy to use” part, the Extreme How-To staff prefers screws that feature a star-drive head, which helps prevent slippage and cam-out. 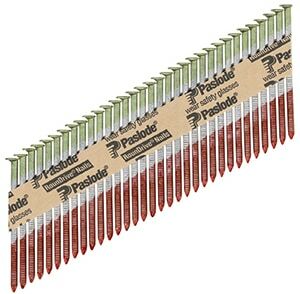 The new U2 Fasteners screw assortment is prime example of this, designed with a “Tight Star Recess” to snugly and firmly engage with the company’s U-Bits so the screws can be installed with one hand. And the innovations don’t stop there. U2 Fasteners offers a new generation of code-approved, premium fasteners in five product lines covering all essential screw types, including the company’s Universal Screw and Construction Screw. The U2 Construction Screw, also known as CS Screw, is the next generation of fasteners that are replacing lag screws. Features include the Tapper Point, which consists of a “Cork Screw Start” and “Blade Cutting Thread” for easy piercing action. The Dome Head enhances structural capability, while the Talon Grip beneath it holds the screw tight to prevent loosening and uses nibs to dig into the material when countersunk. And below the smooth shank is the “Reamer Thread,” which enlarges the hole to create a passage when drawing materials together, reducing tension on the screw head. Approved for structural and ACQ-treated lumber (ER 454), the U2 Construction Screw is available in case-hardened carbon steel and stainless 316. To learn more about these high-performance screws, visit www.u2fasteners.com. Here’s a new one: The people at DeckWise don’t want you to be able to see their product… All you should see when you walk out on your deck is a beautifully smooth, fastener-free decking surface. The DeckWise Hidden Deck Fastener System features a patented, injection-molded clip with a stainless steel insert that is edge-mounted into the side of pre-grooved decking. The Ipe Clip EXTREME series is available in 3 gap sizes: Extreme 3/32″, Extreme4 5/32″ and Extreme KD 1/4″, and can be used with exotic hardwood, thermally modified softwood or composite decking timber. 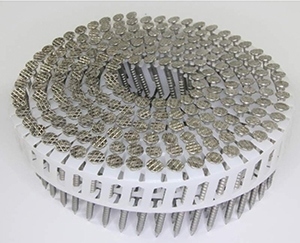 When face-screwing is the only option, DeckWise also offers a complete line of professional-grade stainless steel decking screws for fastening all types of decking material. The DeckWise #10 Bugle-Head, available in 305 and 316 grade stainless steel, easily penetrates hardwoods such as Ipe and Redwood, as well as preservative-treated woods. 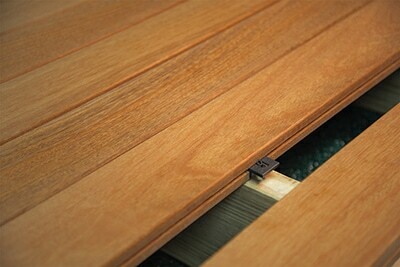 Looking to install composite or PVC decking? The DeckWise Composite Screw has an anti-fade painted trim head that’s designed to eliminate mushrooming or marring the deck surface. 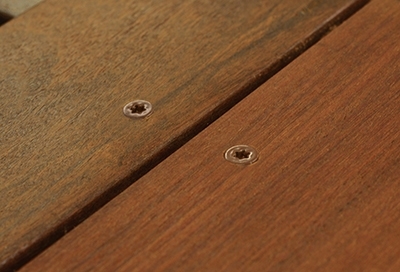 The Composite Screw is available in five colors that match the most popular composite decking on the market today. All DeckWise products are made in the USA. Visit deckwise.com. SENCO expands its fastener lineup to include composite staples and nails for customers requiring blade-friendly, non-rusting, metal-free fasteners. 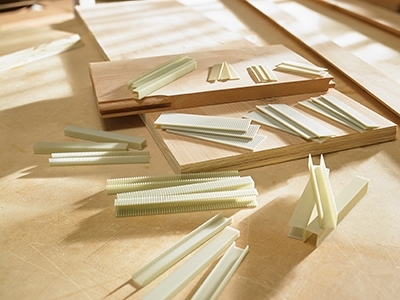 Manufactured with a blend of polymer resin and fiberglass, composite fasteners are beneficial for specific applications in the woodworking, millwork, timber processing and more. SENCO composite staples and nails can be used where metal staples and nails cannot due to moisture or metal detector use. They’re also ideal for applications where sanding belts, saw blades, router bits and molder knives can be damaged by metal fasteners. The new SENCO composite fasteners won’t rust or corrode and are resistant to chemicals, sunlight and moisture. Unlike metal, they do not cause wood deterioration, staining, or long-term degradation of the fasteners’ holding power. This makes them a convenient solution for outdoor projects. Plus, the composite fasteners can be sanded, shaped and cut without damaging equipment. 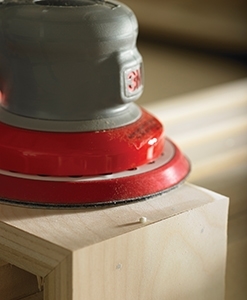 They are ideal for joining smaller and larger boards for machining. They also eliminate the need to clamp or construct complicated jigs for setup. Unlike metal fasteners, composite staples and nails permanently fuse with the material they are being driven into when they are sanded down. This eliminates the need to putty, resulting in a seamless appearance when the material is painted or stained. SENCO composite fasteners are available in standard size strips that fit pneumatic nailers specifically designed to drive composite fasteners. Sizes include: 18 ga brad nails; 15 ga nails; 16 ga and 20 ga staples. Learn more at www.senco.com. Planning new siding or a deck? Wondering if stainless steel fasteners are the way to go? Here are 3 great reasons to go stainless. Financial: Saving money on fasteners? Budgets often focus on the major materials and labor. Fasteners may be considered a possible choice to cut expense—not often a good idea. Consider that stainless steel fasteners extend the longevity and perhaps safety of your project. They reduce the need for future repairs, saving you money in the long run. When reviewing your budget, think long-term effect to determine real cost. Fast-forward to the not-so-distant future. After enjoying your new deck, siding or other outside project, you spot it: unsightly rusting and streaking around the fastener heads. Rusting fasteners look terrible and, more importantly, cause structural problems. Choosing stainless steel fasteners will prevent major headaches later. We depend on our decks to be safe. When decks fail it often causes personal injuries (or worse). Poor choice of connectors and fasteners contribute significantly to failure. Simpson Strong-Tie, an industry leader in structural connectors and fasteners, cites improper construction and fastening, corrosion damage and lack of maintenance as significant failure factors. Stainless steel connectors and fasteners maximize appearance and structural integrity for years to come. Siding, decking and other projects exposed to saltwater conditions, including de-icing salts, should always use marine-grade type 316 stainless steel.